Hello Peeps!!! I hope new year is treating you all well.This is my first blog post in the year 2016 and its about Singapore. 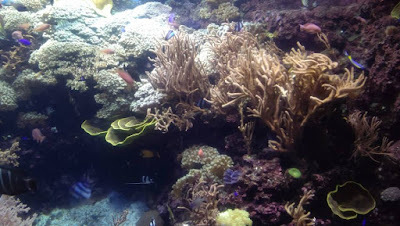 Those who are reading my blog, they already know about many exciting places in Singapore like great shopping zone Bugis Street, commercial zone Mustafa Center, Magical Garden By the Bay (Flower Paradise) and many more. 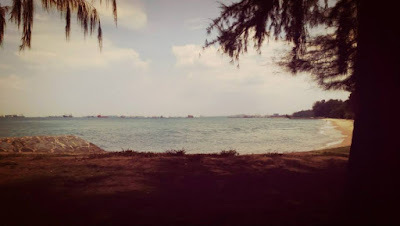 When it comes to Singapore, I must tell you about one place, I completely fell in love with ie East Coast Park, its closer to Airport.. Yes Changi International Airport... but from the main city, you need to travel for around 40 minutes and trust me its worth it. Manicured green field, lots of seafood restaurant, for avid book readers Starbucks coffee zone and all these, dotted with seashore on one side. Could I ask for more? No I can't. Its heaven for students, family people and for health enthusiast who loves jogging or cycling amidst nature. If I am asked about my dream view from my apartment, I guess, all of you know the answer. It will be East Coast Park, Singapore for sure. Luckily when I reached there it was around 4pm and I have witnessed the most blissful sunset along with azure blue sky. I have chosen a light yet colourful outfit here. 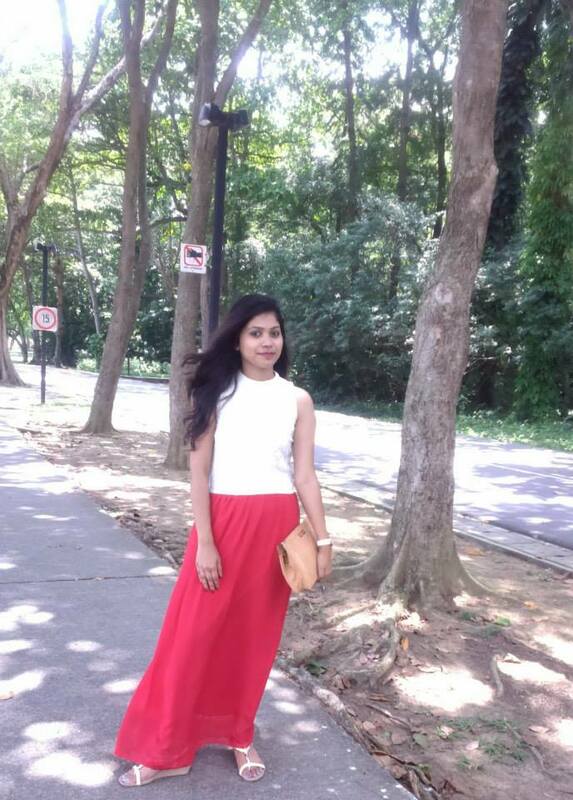 The white and red maxi dress does justice to my travelling spree at East Coast Park. You will feel much more comfortable to walk through the park in this outfit. Since my first post, I am repeating my cravings for maxi dress and trust me, it is the truth.I have paired this maxi dress with a cream colour toned clutch to cut down the brightness of red colour in the outfit. I am a total watch person so a watch is must for me. For sandals, I have chosen a bejeweled white sandal and guys its only for Rs 500 in Indian currency. I have bought it from Singapore itself. My next destination was Sentosa Island. Let me enrich you all with some fun facts about Singapore. Singapore consists of 63 islands out of which Sentosa island has been developed and opened for tourists so far. You can reach Sentosa by cable car ( new mode of transport) or by taking ferry from mainland till Sentosa and last option is taking monorail from vivocity mall. 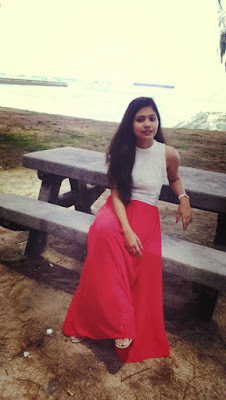 I have taken a conducted tour to Sentosa so that I don't miss any exciting place at Sentosa and its cheap too.The cable car ride to Sentosa Island was enthralling and heart pumping. 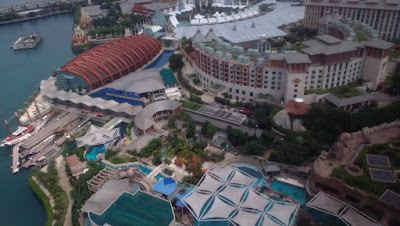 You get to see the whole Island beneath you, a breathtaking view.I have taken a picture of darling Sentosa from cable car. 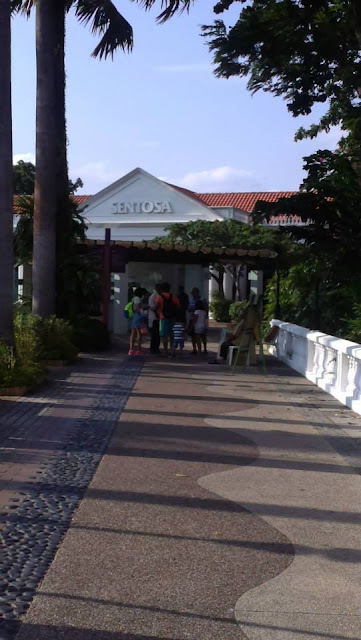 If you are planning to stay at Sentosa for a day or two, its a brilliant idea. Sentosa is a modern paradise of great food, exotic sea view and definitely world class marine sight. They have great Light and Sound shows even in the evening time. I feel lucky to get to see that. Usually this light and sound show depicts a story and the sea water splashing over it and over the audience in an open beach, makes you feel intoxicated. You can also avail the toy train ride ie Sentosa Express to travel from one portion of the island to another. Just like London, Sentosa also houses a Madame Tussauds Museum. This wax museum houses many Indian super stars too. My favourites are Amitabh Bachchan, Kareena Kapoor, Aishwarya Rai Bachchan. Other than this, there are wax statues of Cristiano Ronaldo, David Beckham. So guys, if you are reading my blog, do rejoice. Haha!! Travel Tip If you're a budget traveler, you need not worry. Sentosa also having free bus rides from different stops in the island so that you can travel freely without any worry in mind within the man made modern island. If anyone of you planning to travel to Singapore in the coming days, don't forget to drop me your travel queries and travel snaps. I will be more than happy to be a part of your trip via mails and social media.